Fred Lundgren is life-long entrepreneur. His wife Linda is a native of Houston and a real estate agent since 1980. Linda also owns a Galveston beachfront rental business and other investments. Linda and Fred were married in 1997. Today, they enjoy their home in Katy, Texas where they raised daughters Eden and Brianna. Eden is married to Rodger Salsman of Corinth, Texas. They live in Carrollton and have recently blessed us with two grandsons, Lenoxx and Zayne. Our younger daughter is Brianna. She is an artist and has shown her work at several art shows this year. She also spends much of her time helping Fred and Linda with daily business responsibilities. Mr. Lundgren has two sons, Kevin Wayne and Michael Bradley. Kevin in an organic farmer and Michael manages KCAA's Internet, video and automation systems. Fred Lundgren is the co-founder and managing CEO of Radio Station KCAA, 102.3 FM, 106.5 FM and 1050 AM, Loma Linda, California, a multi media station that serves the greater Riverside/San Bernardino markets. Mr. Lundgren was born in Elgin, Texas and grew up in a farming community in eastern Travis County. As a youth, he was a leader in 4-H and FFA and president of his high school science club. He received awards and recognitions from each of these organizations. After graduation, Lundgren moved to Houston, Texas and attended a radio and television academy operated by two legendary broadcasters, Robert St. John and John Cameron Swayze. After successfully completing the Academy, Lundgren continued his education with engineering courses which earned him an FCC Radio and Telephone License and qualified him to perform engineering duties at most commercial radio stations. Thereafter, Mr. Lundgren gained experience at several Texas radio stations, becoming proficient in all aspects of broadcasting including programming, sales, management and engineering. This experience was essential when, in 1976, Lundgren founded Bastrop County Communications, a corporation that applied for, and received a license for Radio Station KELG 1440 AM at Elgin, Texas, a full time station serving the Austin, Texas market and the first new AM signal to enter the Austin market since the era of LBJ. During the 1970s, Mr. Lundgren also developed and managed a sizable family farm and ranch operation and a small fleet of over the road trucks. The challenges facing Lundgren during the 1970's led him to co-found several rural advocacy organizations including a member-owned cooperative, a member owned Water Supply Corporation, a member-owned State Chartered Credit Union, and a member-owned marketing Corporation. He also served in leadership positions in his local church, the Texas Farmers Union, and the American Agricultural Movement. All this earned Lundgren the reputation of a man who gets things done. Soon, Lundgren was appointed as local election judge in Travis County (Austin) and thereafter became active in Austin area politics. When government funding was announced for "Green Thumb," a federal employment program for older Americans, Fred was appointed as the supervisor for the pilot program where he hired the Green Thumb employees, and then identified, organized, and managed their publicly funded projects from park renovations to day care centers. In 1979, Lundgren was chosen by the Texas Synod of the Lutheran Church of America to serve on the "Religious Task Force On Food Policy". The task force sponsored a multi-faith national conference in Washington D.C. which eventually produced a joint policy paper on food and hunger issues which became the policy of many denominations. These activities drew Mr. Lundgren further into public life. In 1981, he was hired by State Representative Dan Kubiak (a veteran Texas legislator, now deceased). In that capacity, Lundgren worked for a select House Committee where he helped secure emergency funding for the state-wide distribution of chemicals that were used to control the exploding plague of fire ants that invaded Texas schools, parks and other public places during the early 1980s. 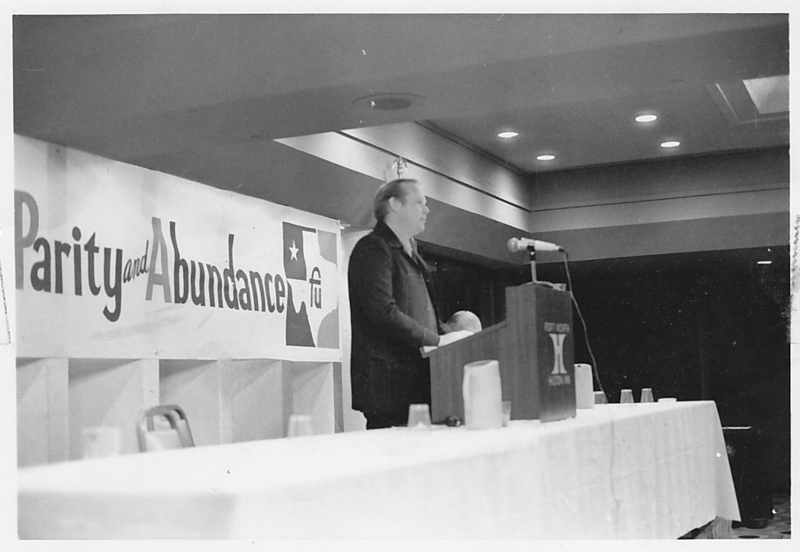 In 1983, Mr. Lundgren sold his business interests and accepted a high profile position as Special Assistant to the Texas Commissioner of Agriculture. Immediately thereafter, Lundgren received an appointment as Staff Director to Governor Mark White and Agriculture Commissioner Jim Hightower's Rural advisory committee and he continued in that capacity throughout White's term in office. For most of his tenure in State Government, which spanned eight years, Lundgren was a Department Of Agriculture spokesman and convention speaker. He represented the agency in dozens of Washington meetings with House and Senate Agriculture Committee members, and he served as the liaison to other federal agencies such as the FDA, EPA and USDA, as well as attending many conferences on food and trade issues in other states. Lundgren also worked closely with the "Little Texas White House", officially known as the Office Of State/Federal Relations, which was the liaison between State and Federal Government. During several statewide rulemaking procedures, Lundgren served as a hearing's examiner for the agency. In 1984, Lundgren took a leave of absence and worked in several political campaigns including the congressional campaign of Wayne Meyer in Northern California, the Presidential primary campaign of Jesse Jackson and he later joined the Walter Mondale Presidential campaign during the 1984 general election cycle. In 1985, Mr. Lundgren received an "Outstanding Service Award" for his work with the rural advisory committee. Over his years of government service, Lundgren received numerous awards and recognitions from trade organizations, and non-profit groups. In 1988, the Department Of Agriculture recognized Lundgren for "Outstanding Service To The People Of Texas" an award presented to Mr. Lundgren by Commissioner Of Agriculture Jim Hightower. Mr. Lundgren left State Government in 1989 to pursue business interests which included several media properties and a fifty-percent partnership in a sizeable oil and gas production company which he and his business partner had been developing since 1982. By 1991, the company had grown to approximately 300 wells, 75 leases, and a natural gas gathering system covering over 10,000 leased acres. Lundgren and his business partner sold the company in September of 1991 during the spike in crude oil prices caused by the 1st Gulf War. In 1992, Lundgren took a career pause to fulfill a thirty-year commitment to himself by co-authoring the book, The Nature of Wealth. The book contains original economic formulas gleaned from a one hundred year historical dissection of the American capitalist system. The Nature of Wealth was underwritten by The National Organization For Raw Materials, an innovative "think tank" and by Acres USA magazine, a leading advocate for environmentally safe foods. The online version of the book is available at http://www.economy101.net. When "The Nature of Wealth" was published, Lundgren resumed his business career full time. During the same period of time, Lundgren earned an interest in the company that successfully moved a new radio station into the Houston, Texas market on 1560 AM. The station debuted in February of 1997. Thereafter, Lundgren traded his interest in the Houston venture for the rights to KBBV 1050 AM Big Bear Lake, California and, with backing from business partners and lenders, KBBV was moved to Loma Linda in 2003. The station covers a population of about 5 million. Lundgren has plans to upgrade KCAA to 50,000 watts. When the upgrade is complete, KCAA will serve almost 20 million people in Southern California. KCAA is recognized as a model of localism and diversity, producing over 50 programs each week on subjects a diverse as marijuana legalization and Vegan diets. Over the years, the station has produced shows that were hosted by Roseanne Barr, Richard C Hoagland, Barry Lynn and Jim Trenton, the original "Poorman" of radio. Today, Lundgren serves as President and ceo of the broadcasting corporation that holds the license of KCAA while managing two Internet companies and occasionally serving as an engineering consultant to other broadcasters. He is a prolific writer with expertise in broadcating, agriculture, politics and macro-economics. In his spare time, he writes opinion articles for Radio Ink, Talkers Magazine and Radio World. In 2012, became a contributor at the Huffington Post. You can read some of his articles here. When he is not working, Lundgren enjoys time with his sons on their 5th generation family farm near Austin where he is building a collection of John Deere tractors including a fully restored 1978 Model John Deere 4640 and the largest "poppin Johnny" ever built, a 1959 John Deere 830 Diesel. Click here to see Fred's biggest radio toy. Lundgren also enjoys taking calls and answering questions about his hobby website that promotes a single product "Treehouse plans". Since 1998, Lundgren has helped parents and grandparents in a dozen countries build treehouses for their children, because as he puts it, "A treehouse is a gift your children will remember forever". Lundgren plans to host a weekly radio program which will be an adjunct to the book, "The Nature of Wealth" Among other correct forecasts, the book, which was written in 1994, correctly predicted America's total public and private debt through the year 2010. Lundgren and KCAA Radio were recently featured in a one-hour Sundance Network television Series called "Loredana Esq". Lundgren played himself as the station's CEO. Lundgren's latest entry into the new world of digital currency with the advent of producerCoins and EmploymentCoins is a challange that promises to bring his lifelong study of macro economics to the masses. Lundgren believes his most important accomplishment is the realization that love is the unifying principle which bonds all of us together and it's infinately more important than building wealth. In 2000, Lundgren, a democrat, made a bid for a seat in the Texas House of Representatives District 130. He spent little on the race while garnering a surprising 15,000+ votes in the general election in a republican controlled district. He used a campaign slogan unique to American politics, "I don't want your money, I just want your vote". Lundgren warns, "You can ignore politics but it won't ignore you".